Read a Poem to a Child for 100 Thousand Poets for Change Day, Sept. 29! This year, 100 Thousand Poets for Change is focusing its campaign on reading poems to children, aware of how their young lives are affected in this chaotic, threatening, and beautiful world. Poetry is a balm for the soul assuring us we are not alone. Children and young people live in the same world we do, with all its kindness and risk. They experience the same beauties and traumas that adults do – they just may process them differently. Our children will live in the world we are making, and that world is not yet one rooted in justice and human dignity. Reading and writing poetry is one of the ways we love each other in this world. As you read these poems to the children in your lives, we hope that they find their lives represented in the poems, that the poems spark their creativity to imagine new worlds and an outlet to express themselves or feel affirmed. We hope children and young people will know that we are at work on the world, striving for the just and supportive world they deserve. 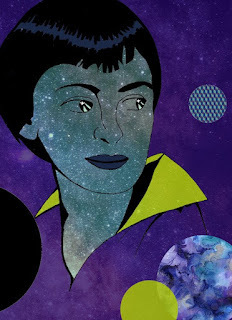 Below we offer 18 poems chosen especially as options for 100 Thousand Poets for Change Day. Some of these poems are appropriate in their language and subject matter for small children, and some are not. Some of these poems focus on difficult topics. We believe you know the children in your life best and will choose well for them. We hope you’ll read a poem to a child on September 29 for 100 Thousand Poets for Change Day and that these poems offer beauty and nourishment for your young ones. 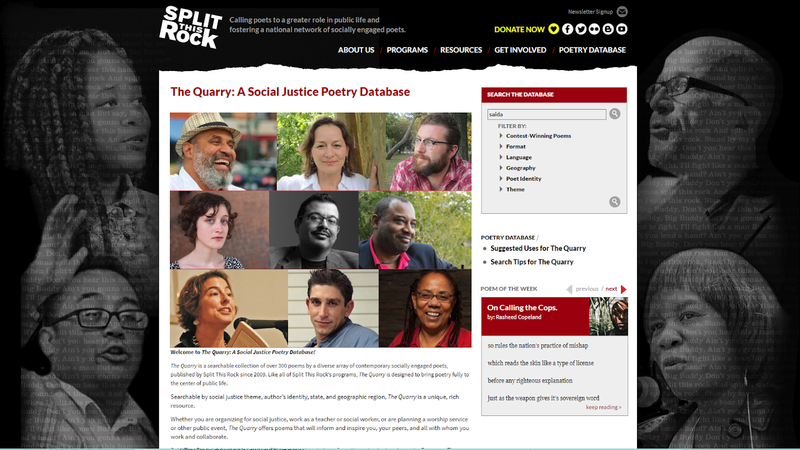 For additional poems, visit The Quarry: A Social Justice Poetry Database. Chen Chen "Set the Garden on Fire"
Tatiana Figueroa Ramirez "En la Casa de Mami Tita"
Joseph Legaspi, "The Red Sweater"
L. Lamar Wilson, "A Patch of Blue in Tenlytown"
Announcing Best of the Net 2018 Nominations from Split This Rock! Split This Rock is delighted to announce our nominations for the 2018 Best of the Net Anthology! These six poems thrilled us with their craft and broke our hearts open with their witness. We hope you will find a moment to discover or revisit these poems at The Quarry: A Social Justice Poetry Database. It is always a pleasure for the staff and guest curators at Split This Rock to discover fresh poems, and an honor to be their first home. From June of 2017 through July of 2018, twenty-nine Poems of the Week came to us as first publications. During that period, poems were curated by special guest curator, Teri Cross Davis, and staff members Sarah Browning, Camisha L. Jones, and M.F. Simone Roberts. The nominated poems are among over 500 poems published in The Quarry. Poems featured in The Quarry were originally published in Split This Rock’s Poem of the Week series or were winners of Split This Rock’s Sonia Sanchez-Langston Hughes Poetry Contest; winners of the Freedom Plow Award for Poetry & Activism, co-sponsored by the CrossCurrents Foundation; or the Abortion Rights Poetry Contest (until 2017, sponsored by the Abortion Care Network). Some of the poets have featured at Split This Rock’s biennial poetry festival and/or Sunday Kind of Love reading and open mic series. Other poems arrive via open calls and/or are by members of the national Split This Rock community, Split This Rock teaching artists, members of the DC Youth Slam Team, and more. Split This Rock is grateful for their work! We wish the poetry judge and all the staff happy reading!